After four successful years of having a Christmas village set up in Weilerbach, the community again will sponsor a Culinary Christmas Village under the motto, “Culinary Art,” Saturday to Dec. 10 at the new village square called Alter Bahnhof, or old train station. The festive opening with the Rodenbach Music Association will be at 5 p.m. Saturday. Each day at 7 p.m. another band will perform live. Blue Monkeys will perform Saturday, Donovan Aston on Tuesday, and the U.S. Air Forces in Europe Band’s Brass Quintet will entertain the audience Thursday. Santa Claus will make his appearance at 6 p.m. Wednesday, after the local kindergarten Arche Noah has performed Nikolaus songs. 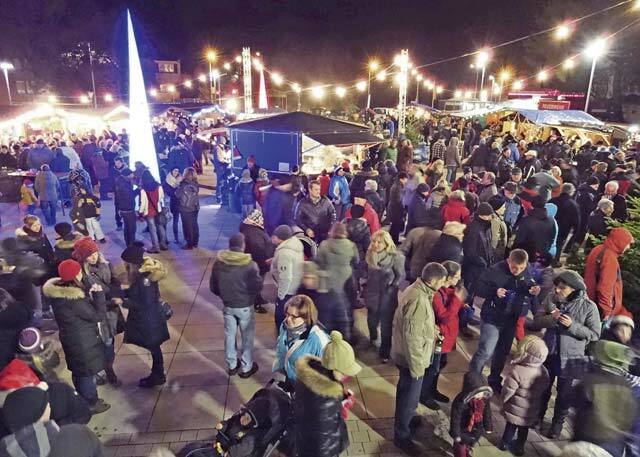 Christmas market goers enjoy the atmosphere and food in the Culinary Christmas Village Saturday to Dec. 10 in Weilerbach.